The OnePlus 5 is an amazing device. From released developer resources to an active developer community, OnePlus 5 has it all. What people forget though is that what made this device a reality is the OG Oneplus One. With its cutting edge hardware and cost-to-feature ratio which took the mid-range segment by storm, OnePlus One has been a trendsetter for the Company and may very well have revamped the pricing model all by itself. It has been over three years since the release of Oneplus One and the device is still going strong, thanks to the folks over at XDA developers and SultanXDA in particular. 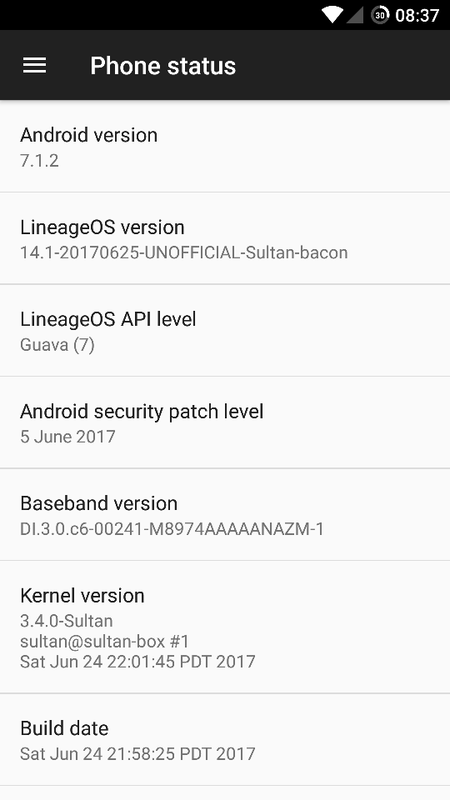 The developer recently released Lineage OS 14.1 [7.1.2] for OnePlus One with an updated Kernel included in ROM itself. Note: The ROM is currently in Beta phase, hence some issues are to be expected. Furthermore, the ROM also enables CPU Underclocking by default which can be disabled by flashing Disable CPU Underclock zip file. Now, reboot OnePlus One device into TWRP recovery.